Coupon Waterfall claims “couponing has never been easier.” Coupons online are necessary if you wish to save money on your purchases. Thus, there are a lot of third party applications and browser extensions that offer to find discount coupons for you. Coupon Waterfall is one of those programs, but we strongly suggest that you do not use it on your PC. In fact, it would be for the best to remove Coupon Waterfall immediately, because this extension is an adware program that may inadvertently expose you to potentially corrupted content. Removing adware applications is essential to your system’s security. Coupon Waterfall is not a malicious computer infection, so it does not need to hide itself from you. It means that you will notice at once when this application starts working on your PC. For one, you will be flooded with annoying pop-ups each time you access online shopping websites. Coupon Waterfall will never stop because this application starts automatically with Windows and then connects to the internet without your permission in order to collect data on your web browsing habits. This behavior is common to all adware applications that Smart Apps have developed. It includes Coupon Lasso, Discount Dragon, Savings Wizard, and many other similar browser extensions. Take note that Coupon Waterfall has its own official homepage at couponwaterfall.com, but the direct download link does not work. As a result, we can say that the only way for Coupon Waterfall to enter your system is bundled downloads. It means that this program arrives together with other freeware applications and that you install the app on your PC willingly. You may not know what kind of additional programs you are installing, but still the fact remains that you do it yourself. Hence, you need to be very attentive whenever you install freeware – read all the installation steps carefully! Upon the installation Coupon Waterfall modifies Windows hosts file by adding 54.225.95.126 ondkeeeaefemdncejfmojnhkphlgfepm line at the very end. The IP address might be different every time, but it still means this application can connect to a remote server behind your back to generate commercial advertisements. The one that modifies your hosts file is BenchUpdater. 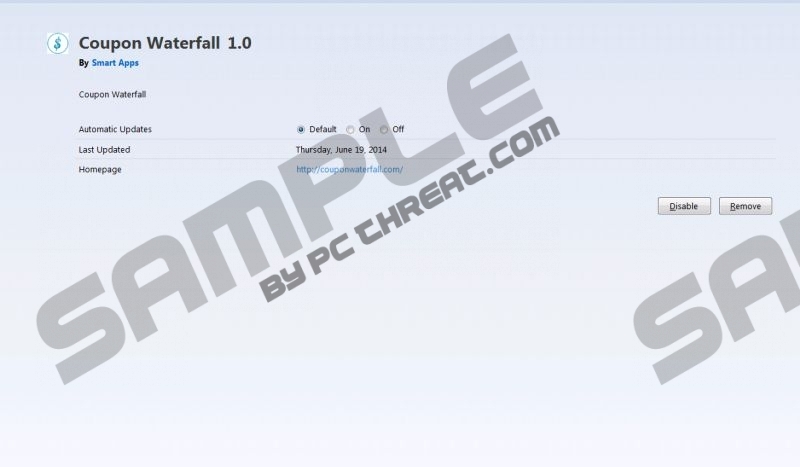 It is an adware helper application that gets installed onto your PC together with Coupon Waterfall. It allows the adware program to update itself regularly. Constant connections to remote servers behind your back and commercial ad spam can seriously jeopardize your system’s security. That is why you need to remove Coupon Waterfall from the PC right now. You might also have other unwanted applications on your system, so the best way to determine them is to scan the PC with SpyHunter free scanner. You have to do all you can to protect your system from potential threats. Double-click Computer and go to Local Disc (C:). Open Windows folder and select System32. Double-click drivers and go to etc. Use Notepad to open hosts file. Delete the additional lines below # 127.0.0.1 localhost and # ::1 localhost. When Charm bar appears go to Settings and click Control Panel. Open Uninstall a program and remove Coupon Waterfall. Select Uninstall a program and remove Coupon Waterfall. Access Add or remove programs and uninstall Coupon Waterfall. For any further questions, you can always leave us a comment in the box below. Quick & tested solution for Coupon Waterfall removal.